If possible, stay out of the water if you have an open wound. If you must go in the water with a wound, cover it with a waterproof bandage. If a cut or wound is exposed to salt or brackish water, wash the affected area immediately with soap and clean water. Use antibiotic ointment as directed after the wound has been cleaned. If the wound shows signs of an infection, such as swelling or redness, see a healthcare provider immediately, and notify them of any water exposures. 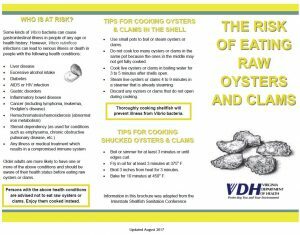 Wear protective equipment such as water shoes and gloves when handling raw shellfish or marine items. 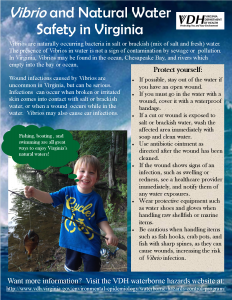 Data about numbers of cases of vibriosis in Virginia is available at the reportable disease surveillance page. Summaries of vibriosis cases by year are available in the reportable disease surveillance annual reports.